Home » Personnel » Working conditions » Working with hazardous substances and gasses » What do I need to look out for during the storage, transport, connection and disconnection of gas cylinders? What do I need to look out for during the storage, transport, connection and disconnection of gas cylinders? The storage and transport of gasses inside and outside buildings is subject to strict statutory regulations. The connection and disconnection of gas cylinders are hazardous tasks. The storage of full and empty gas cylinders not in use must take place outside of the building in a dedicated storage area. Also gas cylinders in use should, in principle, be kept outside of the building. If that is not possible then solutions must be found that are in accordance with the statutory regulations (for example, placing in safety cupboards). The gas cylinder must have a protective cap to prevent the main valve from being damaged or broken off. The reduction valve should always be removed. Gas cylinders must be stored separately in the storage area according to the type of gas contained. Ensure that the gas cylinders cannot fall over (fix with a chain). Empty gas cylinders must be kept separate from full ones and be clearly labelled as ‘empty’. They must be handled with the same caution as full cylinders. Only experts or sufficiently trained persons may transport gas cylinders. Gas cylinders must be transported with a gas cylinder truck; the gas cylinders must be firmly attached to this. Only transport gas cylinders with a protective cap. Never pick up or hoist a gas cylinder by its cap. The cap is meant to protect the vulnerable main valve and can come loose. If gas cylinders need to be hoisted then do this in a container. Do not throw or knock gas cylinders and do not roll them either. Falling, rolling and knocking can damage the main valve or cause it to leak. This also applies to the transport of cold gas cylinders due to the cold brittleness of the material. 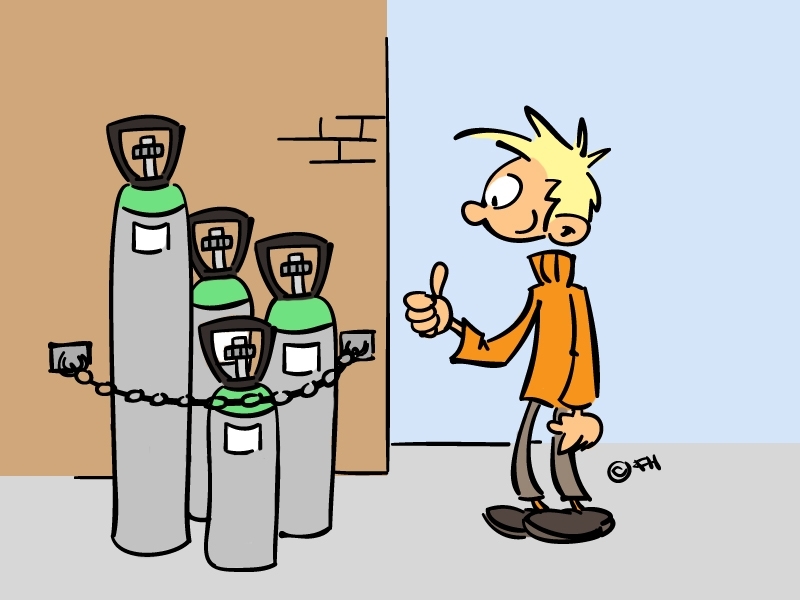 Protect gas cylinders from falling over (use a chain). The transport of gas cylinders in a private car is forbidden. 1.Attach the cylinder with a stirrup or chain. 2. Remove the protective cap if necessary. 3. Connect the reducing valve. Make sure it is the correct type and check that the sealing ring is not damaged. 4. Close all other valves (reducing valve and/or needle valve) before you open the cylinder. 5. Open the cylinder slowly (to protect the membrane). 6. Then open the other valve(s). 1. Close the main valve of the cylinder. 2. Close the reducing valve. 3. Release the pressure from the pipes (open the needle valve and then close this again). (please note: do not allow corrosive, flammable and toxic gasses to escape into the work area). 5. Put the protective cap on the cylinder. 6. Take the cylinder away. Make sure the reducing valve and needle valve are closed. A cap nut may be attached to the valve connection; make sure the valve is properly closed before removing the cap nut. Keep the cap nut safe and put this back on again later. Nuts and swivels with a left-handed thread (for example, in the case of oxygen) always have notches on the side. - avoid leakages! Always check valves using soap suds or an electronic leak detector; never use a flame. Use only an original and good-fitting key for opening and closing the valve. The key must always be kept with the gas cylinder. In the case of flammable gasses place flame extinguishers in the pipe. Repairing gas cylinder valves yourself is prohibited.